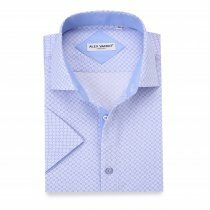 Solid Material, High Quality Long Sleeve Dress Shirt: Our solid shirt is made from soft brushed material, feels soft and comfy, solid enough and it is hard to beat. This collection is made of 100% microfiber, easy care and sport flex. it is a perfect day to night shirt. Small prints with slim fit trousers or under skinny suit is great to office or night out all the prints were unique and delicated designed by our team, and only sold at Alex Vando store.